When searching for a membership coordinator for the chorus, Tally immediately came to mind. Her bright smile and positive attitude is exactly we want to greet our members and guests when they come to rehearsal. 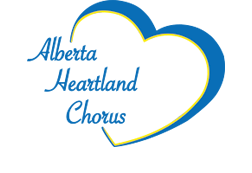 Tally is a charter member of Alberta Heartland, which means she was there from the beginning of our journey. She left us for a few years, but couldn't escape the Barbershop Bug. She joined Heart of Essex chorus and sang with them for four years. At the same time she also sang with Shoreline Sound Chorus which is in Detroit. Tally's heart led her back to Edmonton, her six grandchildren and Alberta Heartland, where she quickly stepped back into her riser spot in the bass section. Currently she is retired, but in her past lives she has taught kindergarten, owned a salon and worked in the retail industry. She is one of eleven siblings and the parent of three daughters.